Since 2010, BE Structural has served the solar energy industry by offering structural engineering services for roof and ground mounted solar systems and solar power management systems. Since that time, we have expanded our service offerings to include engineering for the newest complete solar power system technology including solar skid inverters. Our team of engineers and project consultants began work on solar skid inverters in 2013. The solar skid is used as an off-site/remote option for converting DC current to AC current which then flows back to the electric grid. Our client is a Louisiana based energy company. They asked us to consult on this new technology, their plug and play skid inverter going to an offsite California location. Our first project consisted of a value engineering study on structural considerations pertaining to the new equipment's design, support frame and connections. BE Structural was tasked with identifying any areas of the system that could be improved by reducing the amount of materials needed to assemble the skid on-site. Our results were favorable. Our design team un-covered that the steel support frame, beams and joists could be reduced without compromising the structural integrity of the portable solar power system. Our findings resulted in a steel savings of approximately 2,000 lbs and consequently made the product more efficient and easier to transport. 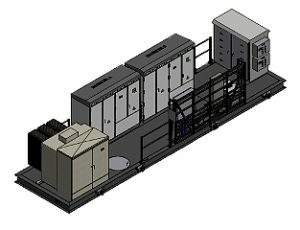 Since our first endeavor, we have performed structural design review and engineering for over 70 new solar skid inverters being installed in three other California locations. Our team is non-traditional and innovative by nature. This work keeps us ahead of the curve! BE Structural is proud to work with companies on the cutting edge of new technologies such as new solar energy options like solar plug and play skid inverters.